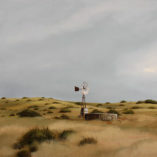 A very moody scene with the rugged outbuildings of a farm is rendered peacefully, leaving the viewer with a sense of quiet and calm, an attribute found in many of Donna’s works. The Orange Free State (Dutch: Oranje-Vrijstaat,[a] Afrikaans: Oranje-Vrystaat,[b] abbreviated as OVS) was an independent Boer sovereign republic in southern Africa during the second half of the 19th century, which later became a British colony and a province of the Union of South Africa. It is the historical precursor to the present-day Free State province. Extending between the Orange and Vaal rivers, its borders were determined by the United Kingdom of Great Britain and Ireland in 1848 when the region was proclaimed as the Orange River Sovereignty, with a seat of a British Resident in Bloemfontein.